nor can man be perfected without trials. 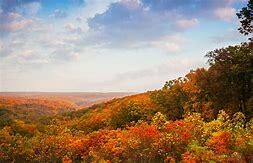 My husband and I drove to Trafalgar Indiana this weekend to attend his yearly family gathering. All Nail/Naile family members that are able to come have been gathering in the same farm house every year on the third Sunday in October for over 60 years. Jim’s mother and her six brothers and sisters have now gone on to the everlife, and WE are the “old folks.” Our newest member this year was 4 months old. Our oldest member, Uncle JK went to the everlife in April. After attending the reunion we drove to Nashville Indiana to spend a few days. At any given time, where ever I go, quotes, conversations and thoughts inspire me to collect ideas for a blog. The quote at the top came today from a calendar at Common Ground coffee shop in Nashville in the hilly Brown Country territory. We are all in the grinder I thought as I read the quote off of the little piece of paper! Iris is the shop owner and takes care of everyone that walks into the shop who is willing to respond…just like family gathering. What a wonderful lady! This Monday morning, the busyness of early morning customers was complete, and she greeted us at the door with big hugs, then sat with us at the little table catching up on each of our year’s events. In most cases, when friends gather, the conversation eventually ends up discussing the “frictions” and “trials” of life. Not this day. We chose to discuss the joys! In this world with so much on our minds…this kind of greeting is rare. Choosing joy renews my spirit, my soul. I was reminded of an article I had read earlier in the week by Anne Lamott that I had found online. I love her ideas of solutions to life’s challenges. She is a woman who had many major bumps on the road of life in her early adult years. She describes her conversation to Christianity beginning with seeing Jesus sitting in the corner of her room as she was in the pit of despair. Also, a little church choir’s music from across the street where she lived called to her. She refused to let the invitations in. She describes her experience of refusing to “let Jesus into her life” like a cat following her: “…you let a cat in one time, give it a little milk, and then it stays forever.” She finally said, “Okay, I quit. I took a long deep breath and said out loud, ‘all right. You can come in.’” Thus began a new life. Many helped her recover. She responded by becoming an author committed to helping others with her writing of fiction and non-fiction, speaking, and becoming an activist. This story can be found in her book Travelling Mercies. Her work has inspired me many times – she has inspired and helped many. This particular article was from the October 2018 issue of the National Geographic magazine.I was again inspired by her ideas, this time related to showing up with hope. 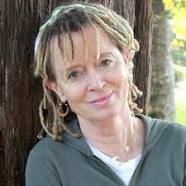 ‘Show Up With Hope’: Anne Lamott’s Plan for Facing Adversity. the best-selling author asks: What better time to be hopeful? That certainty caught my attention! She goes on to say, “…all the hunger, anger, fighting, and pestilence going on, let alone the self-destruction or severely annoying behavior by certain people both famous and just down the hall, you would have to be nuts to be filled with hope so rife with trouble. Yet I have boundless hope most of the time.” WOW! How does it happen that many people have boundless hope and are able to share it in these times? In my opinion, it has to do with looking at life from a ‘big picture’ perspective, rather than from just the human part of ourselves; our five senses and our brain that holds onto the teachings and experiences of our culture. What about our mind that is still conscious after what we call death? Are we listening to our heart? Are we taking seriously – really listening – to the voice of God that is communicating with us all the time? Are we aware that we have a soul, that we receive communications from God? How does God communicate? 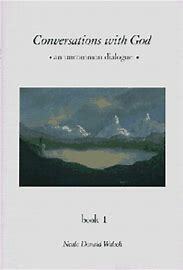 Neale Donald Walsch’s book Conversations with God: Book 1 gives me an answer to consider. Neale was asking this question all the time as his life was out of control, and not thinking he was getting an answer. Then one day, he did hear God’s voice. “ I talk to everyone. All the time. The question is not to whom do I talk, but who listens?…exchange the word talk with the word communicate…it’s a much fuller, more accurate one… My most common communication is through feeling…feeling is the language of the soul…I also communicate with thought…I often use images and pictures… In addition to feelings and thoughts, I also use the vehicle of experience as a grand communicator. ” ~ p. 3. Another WOW! God has our back! As Anne Lamott mentions in her article, we all have lived through devasting times and tremendous loss that we feel we will never overcome! Our daughter Anne’s death was such a time for us. But God – the creator of the universe – had a plan for such times – for all of our ‘such times’ of devastation. I definitely FELT God’s thread of communication as I struggled through this loss. I hung on for dear life to the HOPE that Anne lived on and that my life would again be able to feel joy. My LIGHT experience – IANDS names it a Spiritually Transformative Experience (STE) – gave me the EXPERIENCE of indescribable peace, joy, and love at a time I was crying almost twenty-four hours a day. It is what awaits us in the everlife. Through HOPE, peace, joy and love is available here on Earth too! I look at my life and the lives of those around me with new eyes and new tools. Our lives are full of ups-and-downs, frustrations, disagreements, and overwhelms. It is not wise to isolate myself from this world. I have a new vantage point – I have comprehensive guidance and support. I bring to problem solving my human experience and my soul experience. I also think of the continuation of life in the everlife and the possibility that I live more than one life. I ask the question – What have I learned about how to live life? What is the loving thing to do in this situation? 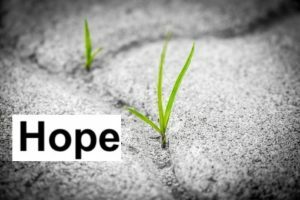 What will bring hope? “By showing up with hope to help others, I am guaranteed that hope is present. Then my own hope increases. I still find myself in despair some days, but not many. When I shift the focus to the love and help I have been given, it reminds me to pass it on. Don’t under estimate the power of your acts of kindness. Don’t under estimate the power created when two or more are gathered. Our tendency is to want to fix and save, but that is not our job. The ‘loving’ answers are within each one of us. Each one of us has the ability to be moved by grace to a deeper understanding of our own situation and the situations going on in the world around us. We can find the strength within to move forward with courage, knowing that we are not alone. With chaos comes growth. We can find solutions that bring us back to stability. ← LIFE and the UNIVERSE are YOU!